What's Possible With Open Access to Cleveland Museum of Art Collection? The Cleveland Museum of Art is opening online access to images and information from its extensive collection for the public to use freely. This move makes way for people to come up with new ways to use the artwork and information about it. To illustrate some of what’s possible, the museum teamed up with creative partners in the community, including American Greetings and Case Western Reserve University. They presented their innovations as the museum announced the initiative Wednesday. Designers at American Greetings created cards using artwork from the collection. “It was really fun to start to play around,” said Lynne Schlonsky, senior art director at American Greetings. 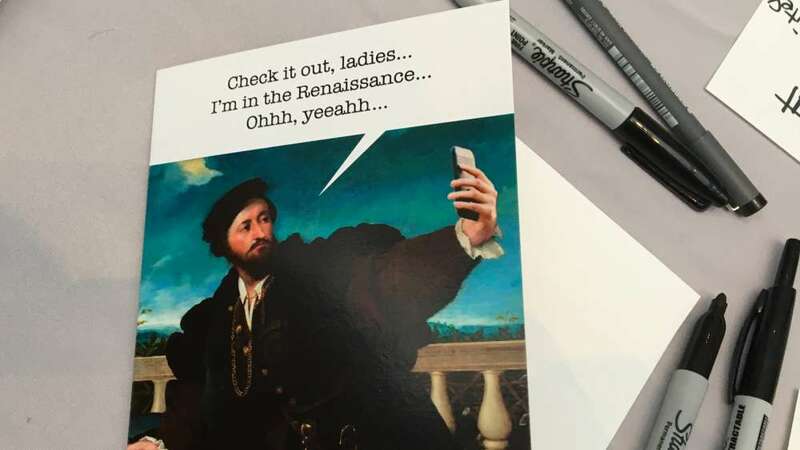 One of the cards American Greetings designed using Cleveland Museum of Art's collection. 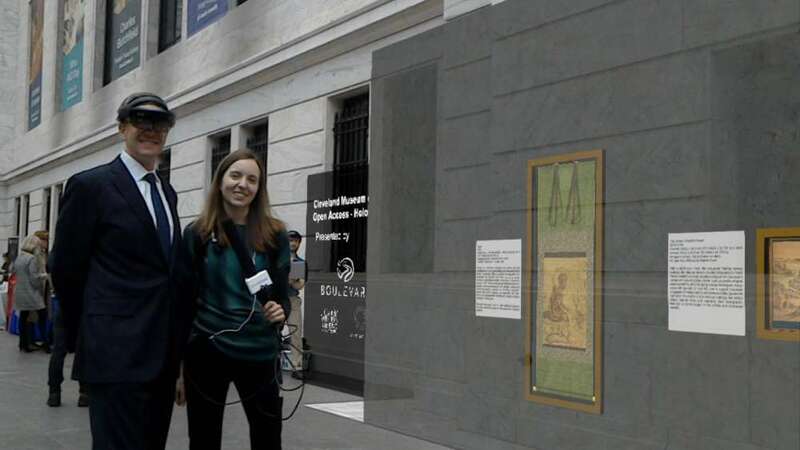 A team at CWRU developed a way people can virtually visit the museum wearing special glasses. “It’s a mixed reality device that projects laser light onto your retina, and when it does that it gives you the impression that you’re seeing something in 3-D in the world around you,” CWRU Professor Mark Griswold said. Nancy and Joe Keithly try out a virtual visit to the museum. While wearing the glasses, people see pieces of art appear along with their surroundings. The device, Microsoft HoloLens, is not widely available and costs $3,000 or more, but it demonstrates one way to use the collection data now freely available. 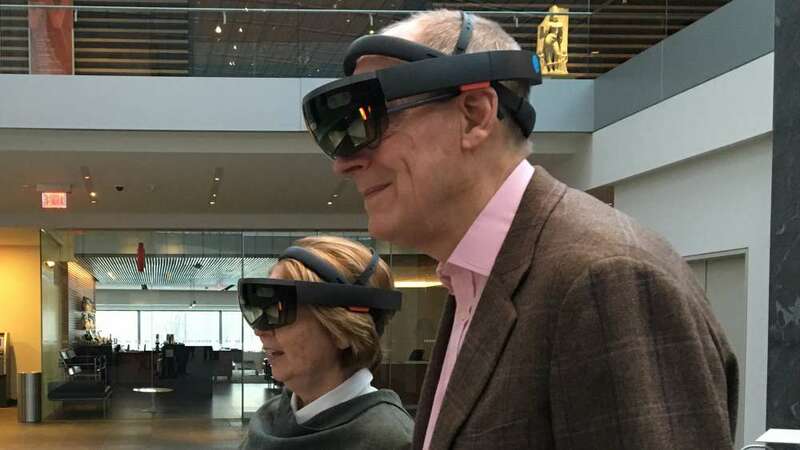 This is a screen shot captured while someone wearing the HoloLens looked at CMA Director William Griswold, ideastream's Carrie Wise and artwork virtually displaying on the right. The decision to allow unlimited digital access fits with the greater mission of the museum, Director William Griswold said (unrelated to Mark Griswold). Admission to the museum has been free since 1941. “We’re here to make these works of art that belong to all the people available to them whether they live in China, Australia or Cleveland,” William Griswold said. He also sees this as a trend in the field, citing other museums already providing such access, including the Metropolitan Museum of Art in New York. This launch includes free use of 30,000 images it can legally make available to the public, which is about half of its collection. “Every year more of our collection will go into the public domain for people to use,” said Jane Alexander, the museum’s chief digital information officer.